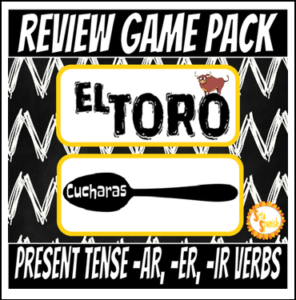 TWO games to review verb forms with your students! Students try and collect all the forms of a verb before the other players in a fast-paced trading game. The first person to collect all the forms of the verb wins! The vosotros form is included, but if that isn’t something you use with your students there is a second set without vosotros! There are also printable spoons or spoon game boards for Cucharas. There are instructions and materials for ¡El Toro! and ¡Cucharas! (Spoons) for your students. After my students become familiar with both games I love providing both options and letting them choose which game they prefer to practice with. • Look for the green star near the top of any page within my store and click it to become a follower. You will then receive customized email updates about this store!